The flight down from LA was good although I was happy to be off it. 8 hrs is a long time for anyone. Everyone commented on how good the kids were. We landed at 10pm old time. 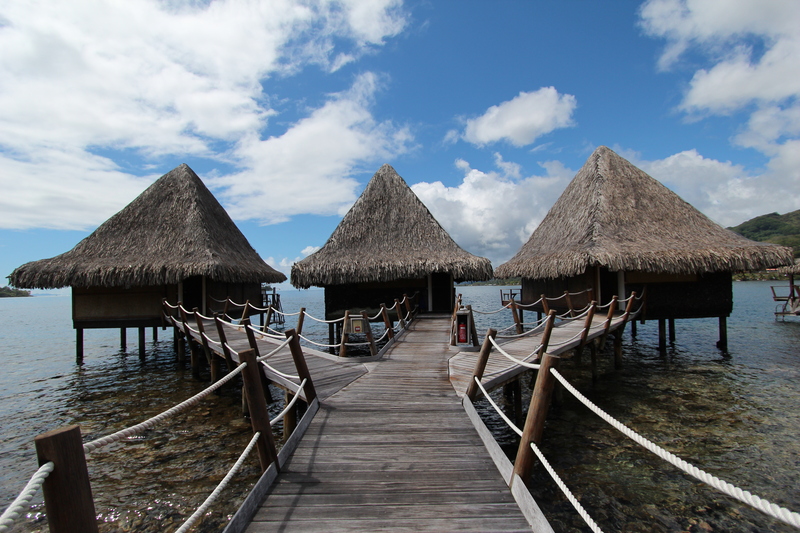 We stayed at the airport hotel last night in Tahiti. Not what you may be familiar with, but very clean. Happily, they had a “family room”, which means; three beds, a bathroom with three sinks and two showers, and there is enough floor space for a blowup mattress for ash. It made me wonder if we would be so lucky in the future. We were awoken by a seriously time challenged rooster at three or so. Breakfast of pain au chocolate and hot coffee. Now on to Raiatea. We could all barely contain our excitement when we recieved the key to our very own thatched hut bungalow hanging over the coral reef. The view of the undersea garden under our house is mind-blowing, fish of every colour and size swimming right under our house! Don (already wearing his bathing suit-smart!) jumped in first and then it was a race to grab the bathing suits and snorkels. It’s a fantasy come true for me and maybe a new one for Gwen. She announced that when she grows up, she would like to “travel the world snorkeling and diving.” Sounds good to me. Today, we meet up with our boat (after our mandatory hour of French lessons- les mathematic, cahier, et lecture en francaise) and embark sometime this aft for 10 nights on board. I can’t imagine getting an Internet connection out on the boat, so it may be awhile until I can post again. Okay, I AM envious already and you’ve only just begun!